The Junior Pillar Award recognizes school children within our community who have demonstrated unique acts that actively build and nurture one of the six pillars of character. This award is made in conjunction with our schools. PURPOSE: The Junior Pillar Award is designed to recognize and support a student for a specific action that exhibits one or more of the Six Pillars of Character. GOAL: It is an opportunity for the Bloomingdale Character Counts Coalition to more directly support the Character Counts program in the local schools and athletic programs. DESCRIPTION: A Junior Pillar Award is a certificate that honors a student or athlete for a specific action that reflects one or more of the Six Pillars of Character. A student must attend a school that is a member of the Bloomingdale Character Counts Coalition or participate in a Bloomingdale affiliated youth services program. A teacher, staff member or coach will nominate the student to one of the members of the coalition. 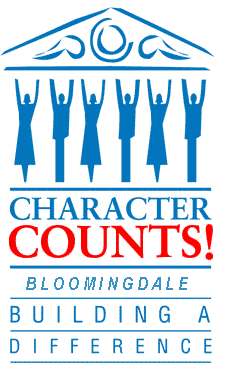 He/she will state in writing what action/behavior the student displayed to qualify for the recognition and that statement will be presented at a Bloomingdale Character Counts business meeting by an attending member. Upon review by the members present at that time, the nomination will be voted on. Once a nomination has been voted on and approved, a certificate will be completed with the child’s name, school, date and signature of the current Bloomingdale Character Counts Coalition president. Arrangements for the presentation of the certificate will be made by a coalition member with the teacher, coach and/or principal of the nominated student. One or more coalition members will be available for the presentation at the child’s school or sports meeting. After consulting with the principal/teacher/coach, it will be decided whether a private presentation or in the presence of other students would be most appropriate for that student.